This post has actually been sitting in my draft box for two month's now! I was just going to delete it as Sophia has been walking and got her first shoes age's ago but I thought that it would be nice to post it so I can look back on when she started to walk and getting her first shoes. Sophia has always been really quick at doing thing's ever since she was born she is really smart for her age so she obviously does not take after me or her daddy she has been sleeping on a night time since the day she was born, she was rolling over at just twelve week's old and she just seems to pick thing's up so easily and loves to learn new thing's. But Sophia never really properly crawled, she bum shuffled along the floor really quickly to get what she wanted from around 5-6 month's but at Christmas time, when she was 7 month's she started pulling her self up on furniture and cruising along the sofas. Before long she was walking along pushing her baby walker at 8 month's old then when she was 9 month's old she took her very first step. 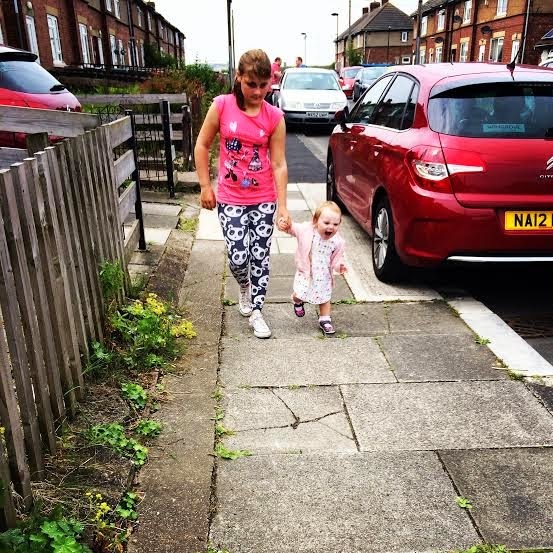 She would only take one or two steps then fall back down on her bum but she didn't give up and seemed determined to walk. 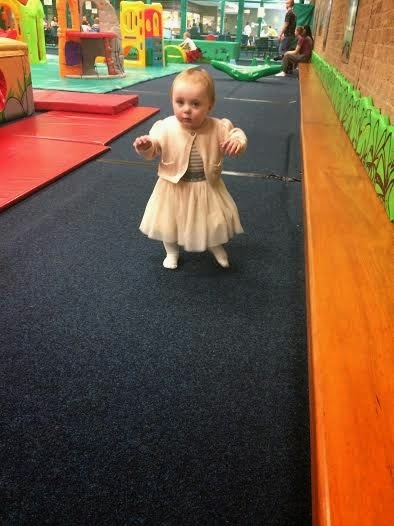 When she was 10 month's old she started to walk properly across the room on her own, although sometimes she was still a bit unsteady on her feet. As soon as she turned 11 month's there was no stopping her and she was toddling along confidently all over, she was even talking steps when we were out in public and wanting to walk everywhere so we had to get her some shoes. Like most parent's when you think of getting your child's first pair of shoe's you go straight to Clarks and that's what we did. I always remember getting all of my shoe's as a child from Clark's back in the day when you get a secret key hidden in the sole of your shoe. And I have always taken my oldest daughter Chloe to Clarks to get all of her shoes, although now she is starting secondary school I don't think she will be wearing them anymore as she lives in converse these days. 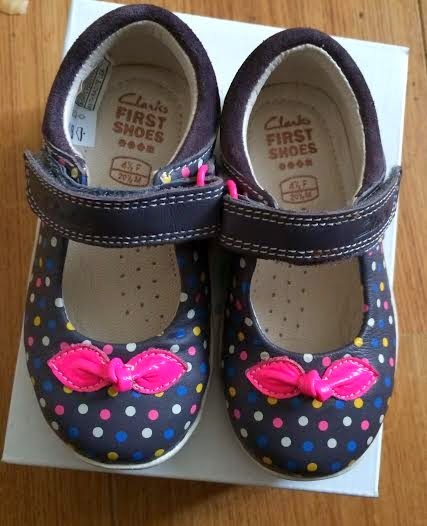 So we went to Clarks and they measured Sophia's feet and she was a four and a half f they brought a selection of shoe's out for us to pick from and me and her daddy both picked the same navy dotty shoe's. But of course, when we tried the shoe's on Sophia she refused to stand up or walk and just sat on the floor trying to pull the shoe's off and eat them! And getting a photo of her with her shoes on was a nightmare, she just would not look at the camera. They were £34 and they will only last a few month's as she is grown so much all of the time. But I just love Clarks children's shoes and I personally think that they are worth paying a bit extra for, as your child's feet are measured properly and I hate seeing small children going around with really cheap looking shoes on. Now Sophia is almost 14 month's old and she walks everywhere and climbs and runs and is so confident on her feet and loves walking outside with her shoe's on. She is no longer my little baby but an actual cheeky toddler who is into everything. I couldn't wait for her to start walking but she really is so much harder work now she is. So to all them parents out there who are wishing there babies would hurry up and walk, enjoy them not walking for now because when they do find there feet you will be exhausted from chasing them all day.